David and Lance beat AMAZING RACE contestants to Selaron Stairs!!! So we had a bit of a head start…..we have been coming to Brazil for many years! The TV show, “Amazing Race” closed it’s season show last week in RIO. This show as per TV market research has 25 million viewers each Sunday. 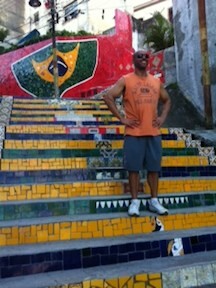 The contestants flew into Rio and took the Bondie to Santa Teresa to find the SELARON STAIRS! Santa Teresa ROCKS!!! 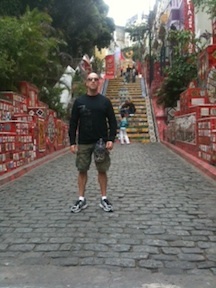 Ok, for those of you who don’t know what the SELARON STAIRS are or who Jorge Selaron is…..read on! Taken from the MOSAICSOURCE.com web site quoting Mr. Selaron! “I was born in Chilli in 1947 and, after travelling, working and living in more than 50 countries, I arrived in Brazil in 1983. In 1990, I started work on my major masterpiece which, little by little, turned into the most original stairway in the world. It has 250 stairs and is 125 metres long. In the beginning, everyone laughed at me I covered the steps in green, blue and yellow tiles – the colours of the Brazilian flag. As I worked, my profession changed from painter to sculptor, my hands covered in blood, calluses, irritating and in pain. Even though the work was difficult, I was passionate about it. How to get to the SELARNO STAIRS from Casa Cool Beans…..